Tamales are great, but kind of a pain to make. At least, that’s my usual feeling about them. Since I’ve entered my retirement phase of life, though, I have more time to cook, so I’ve been exploring different types of potentially lengthy recipes. Tamales are my current project. A couple years ago I entered a tamale recipe in my “Main Dishes” document. Not sure I’ve explained my “recipe documents” before. Perhaps I should take a second to describe these? It’s like this. Back in the 1990s I began entering my recipes in a word-processor document using, of course, Macs. It began as one document in Word. Then I split into categories and put them in Framemaker. After Adobe stopped making an Apple version of Frame, I moved them all to Apple’s Pages. I sometimes treat my recipe documents like a diary – I talk to myself in them. My tamales entry is a great example of this trend of mine, and it’s also the recipe that is the focus of this blog entry. Below is the recipe I wrote down then (a couple years ago) and it is the recipe I used exactly last week. I know when a recipe is perfect in my recipe documents by the fact that when I make it, I make no new changes. That is this one! Note: This recipe is supposed to make 10 tamales, the folded style. I only make 6 because this is the way I like them! The top is open or only lightly covered by the husks. This is how they made them at the Zolo Grill in Boulder, back a few years. It allows the tamales to be fluffy and full of filling, rather than a smashed paste of filling between thick layers of masa. Soak 6 corn husks in boiling water (clean them if necessary). They take about an hour to become nice and pliable. Cook the corn for a few minutes in boiling water (on the stove top or in the microwave). Drain it. Process the corn in a small or large food processor or just chop it fine. Put this corn in a measuring cup and make the volume to 1/2 cup with water. Put the masa, salt, and baking powder in a food processor and pulse a couple times. Add the lard in chunks and process briefly until the lard is in less than pea-sized lumps. Dump into a bowl. Add the corn/water mixture and mix the dough until it is wet. Add more water in small amounts, mixing after each addition, about a couple tablespoons total. You want the dough to hold together but do not work it too much. Lay out 6 corn husks and divide the dough among them. Spread the dough to within an inch or so of the corn husk edges. Add filling on top. Tie the ends with string, like in my photo at the top of this page. Steam about 30 minutes. I use a stove top bamboo steamer set inside a wok. 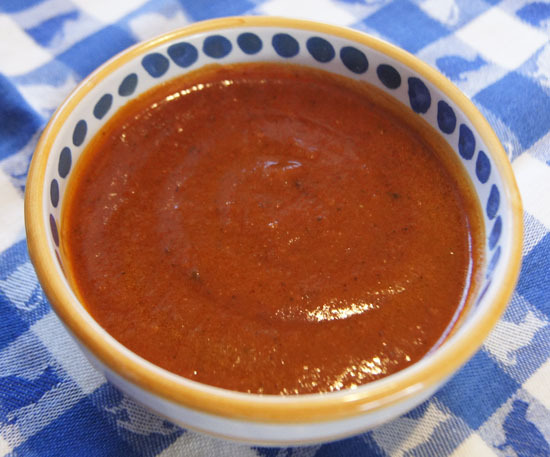 If you like, serve with a sauce like enchilada sauce. These are just suggestions! I do like cheese in chunks in my open tamales, as they melt into a nice gooey mess. Chicken: Cook a boneless chicken breast in boiling water until done. Chop into pieces, or shred with a fork. Saute in a pan with onions and garlic, then add chiles and tomatoes (salsa, fresh, hot tomato sauce, or some other sort of mixture). I like sliced olives too. Add cumin and chili powder and cilantro and other seasonings as desired. Cook until flavors combine, then cool. Fold in chunks of jack cheese before laying the filling atop the tamale dough. Pork or beef: Use you favorite homemade pork or green chili. Aim for up to a half-cup of filling per tamale. Beyond that, use your imagination. 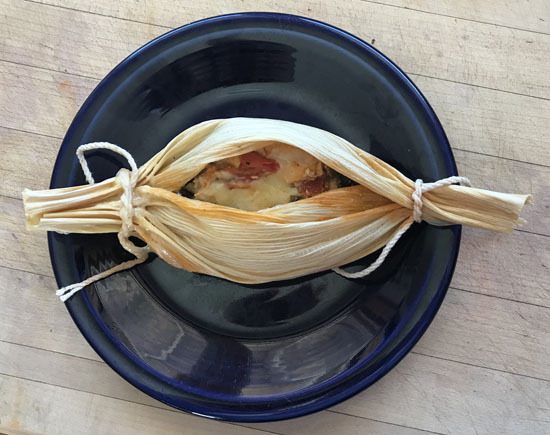 Zolo’s makes wild mushroom tamales. I’ve seen sweet potato ones too. Or turkey, fish, duck with mole sauce, pumpkin . . . just use your imagination. Cream puffs are little pillowy clouds of pastry that can be filled with wonderful things. Like strawberries and whipped cream! Way back when, I found a recipe for Strawberry Cream Puffs and liked the recipe so much that I hand-wrote it on a recipe card. I got it in my mind to make cream puff shells this week – for Valentine’s Day dessert. Pretty red strawberries, very lightly sweetened, mixed with cool whip, inside puffy shells, perhaps with a little thin chocolate syrup drizzled on top . . . a dessert worthy of Valentine’s Day but, actually, light in carbohydrates. Why? Because cream puff shells are made from flour, butter, and eggs. There is only 1/2 cup of flour divided amongst 8 cream puffs, so about 50 flour calories per serving. Yes, there is a lot of butter, but . . . actually, only 1/2 tablespoon per serving, or another 50 calories. I can live with these values on the semi-low-carb diet that we are striving to pursue. So, cream puffs. Where is my recipe? I search first in my recipe box. The recipe card is not there. I must have left it somewhere else, perhaps tucked in a cook book. I can’t find it in any books, though. Maybe I transferred the recipe to a document? I searched my “desserts” document – it is not entered there. I had almost given up, when I decided to do a wider search. Luckily I found my notes on and a recipe for cream puffs in my “appetizers” document. Below is what I wrote to myself a few years ago. “The recipe in the Joy of Cooking (p. 597) was probably my old standby, and/or the Strawberry Cream Puffs recipe on the recipe card, until I tried the recipe below in 2010. The Joy of Cooking recipe is 1 C flour, 1 C water, 1/3 C butter plus 4-5 eggs. Below is my new version of the Cooks Illustrated recipe. It is almost the same as the published one, but I eliminated the step that dries the cooked cream puffs in the oven. The puffs do not seem not wet inside so I skip that step. Heat the oven to 425˚. You need it hot when you are ready to put the pan of puffs in the oven. Also prepare a half sheet pan by placing a piece of parchment paper on it. Mix together the 2 eggs and the egg white in measuring cup. If it measures more than 1/2 cup, discard the excess. Set aside. Bring butter, milk, water, sugar, and salt to boil in saucepan over medium heat. Keep an eye on it, stirring occasionally until it reaches full boil (the butter should be fully melted). Immediately remove the pan from heat and stir in flour with a wooden spoon until combined and mixture clears sides of pan. This takes a little hard work, but only about a minute. Return the pan to low heat and cook, stirring constantly, using a smearing motion, for 3 minutes, until the mixture is “slightly shiny with wet-sand appearance and tiny beads of fat appear on bottom of saucepan”. If you have one, use an instant-read thermometer to check the temperature of this dough – it should get to 175 to 180˚. Immediately transfer the hot dough mixture to a food processor. Process for 10 seconds to cool slightly. With machine still running, gradually add the eggs in steady stream (takes less than a minute). When all eggs have been added, stop the machine and scrape down sides of bowl. Then, process for about 30 seconds until a smooth, thick, sticky paste forms. These are ready to bake immediately. Drop the dough onto the parchment-lined baking sheet. For large puffs, I make 8; you can also make a dozen or so smaller puffs. You can used this same dough to make elongated puffs for eclairs. The best way to form cream puffs is by using a pastry bag. I do own one of these now, but haven’t yet used it for puffs. Sounds like a lot of mess to clean the pastry bag after use! But I am sure the puffs or eclairs would be a lot prettier than my free-form ones. Bake 15 minutes in the 425˚ oven (do not open oven door during this cooking time). After these 15 minutes, reduce the oven temperature to 375˚. Continue to bake for another 8-10 minutes, until golden brown and firm (puffs should not be soft and squishy – you can open the oven at this time to check). Carefully transfer the puff to a wire rack to cool. The original recipe says to cut a slit in the side of each puff, turn off the oven, prop open the oven door, and leave them for about 45 minutes, until crisp. Julia Child’s recipe also includes this step. 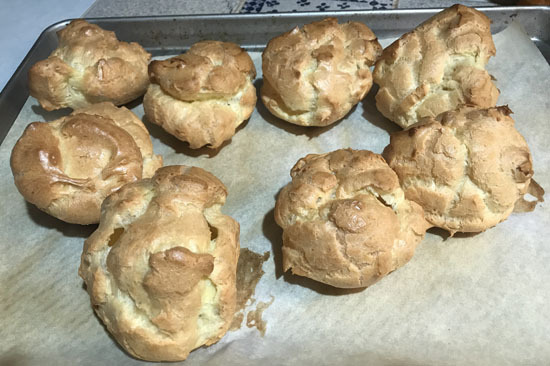 I sure it is worth trying, but I am happy with my un-crisped cream puffs. The big free-form, un-dried puffs that I make for stuffing with strawberries and whipped cream are in the photo at top of this page. I find them perfectly acceptable! Homemade flour tortillas! Don’t they look delightful? And these tortillas are my first try. My first try! I came across several recipes on the web and decided on a King Arthur Flour recipe. Turns out I was correct in choosing a recipe from this dependable site. I’ve been using King Arthur flour and their web site for years. The above tortillas are made with all-purpose flour. Eventually, I plan to make them with flours other than white flour, but this is where I begin. 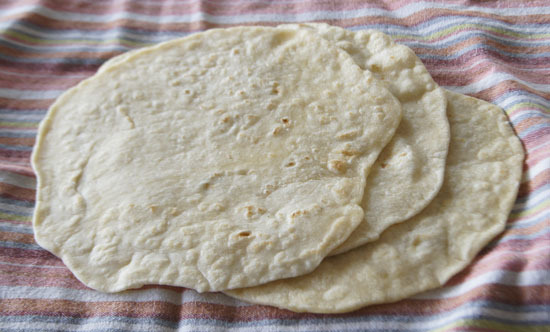 Here is the King Arthur flour recipe: Simple Tortillas. For the ingredients, you can choose from several fats: lard (traditional), butter, shortening, or vegetable oil. I chose lard for my first try. 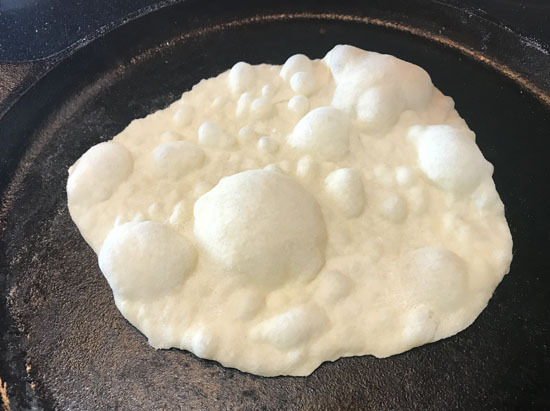 It came from lard in a jar that I bought at Whole Foods over a year ago. The original recipe calls for 1 teaspoons baking powder, but I left it out for Try 1. Begin these tortillas several hours before you plan to cook them. Microwave 1 cup of water for one minute. Pour about 3/4 of it into the dough and immediately mix it in with a spoon or fork. Add more water only as necessary for the dough to hold together. Put the dough on a breadboard and knead a few times, until the dough forms a ball. Divide the dough into 8 equal-sized pieces: I used a scale. Set them out at room temperature, well-covered, for about 2 hours. Cook the tortillas about 30 seconds per side. Results for Try 1: The tortillas looked great, but either they didn’t have enough salt or the lard was too strong a taste. Although, in burritos, the taste was hardly noticeable. Notes: I think the “trick” in this recipe is having the dough rest for a couple hours before rolling. While browsing the web, I found other flour tortilla recipes that called for a rest before rolling, from 15 minutes to 2 hours. I chose the 2 hours, as per my own experiences with breadmaking, especially no-knead doughs. Flour does something magical when mixed with water and allowed to sit. Another trick is rubbing the flour with a solid fat before adding the water. This makes the gluten in the flour separated by bits of fat, and it rolls out easier. How will oil work? That will come in another try. I left the baking powder in the KA Flour recipe out. Why? The first time I simply forgot it. Later, I read this on the Mexican Please website: “And regarding the baking powder … sometimes I use it and sometimes I don’t. It will make them a little bit thicker and fluffier. That works great if you want the tortillas to double as flatbread or pita. 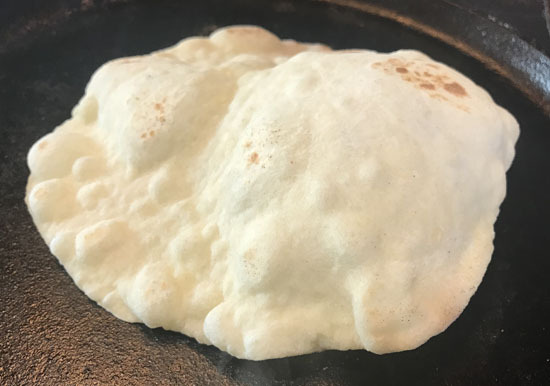 If you want a thinner, traditional tortilla then you can omit the baking powder.” I do like my tortillas “traditional”, but I will try baking powder in one of my sets of trials. Combine ingredients, form into balls, let rest, and cook as in Try 1. Notes: The pan heat: 400˚ is the target according to KA. I got the pan to 400˚ by heating on medium high for several minutes. I used the remote temperature thermometer that we use for pizzas. I found that the pan kept heating up at medium high. By the time I was on the 7th tortilla, I had the pan all the way down to 3. It was great to cook them at this temperature – no burning at all on the batch. Mix the flour with the salt. Add baking powder to one try and leave it out of the other try. Add about half of the hot water to each try and then all of the olive oil and mix it all together. Add more water to each “trial”, but only as necessary for the dough to hold together. Put the dough on a breadboard and knead a few times, until the dough forms a ball. Divide each dough into 4 equal sized pieces, roll each into a ball, and let sit 2-3 hours at room temperature. Results: In general, the olive oil trials needed less water. In fact, the tortillas were a bit smaller, and you might want to roll out only 3 from a small batch (1 1/4 cup flour size). Both the olive oil trials yielded tortillas that were more pliable than the lard or shortening trials. The tortillas made with baking powder really puffed up on cooking! After cooking, both types – with and without baking powder – were almost interchangeable. The same one after a few more seconds. Note how high it has puffed! Here is a comparison of a baking powder tortilla (left) verses one without baking powder (right). The sides we are seeing are the second sides cooked. Note that the non-baking powder tortilla has smaller brown spots. Notes: The cast iron pan kept heating up as I cooked the 8 tortillas. I started with the burner at setting 6-7 to preheat to 400˚ on my remote temperature sensor. When I added the first tortilla, I turned the burner down to 6. As I continued the cooking additional tortillas, the temperature creeped up, and I turned it the burner down to 4 or 5. The pan temperature still creeped up, and was 570˚ after I cooked my last tortilla. They were not burning at 570˚, but do keep aware of temperature changes of the cast iron pan. Cooking 8 tortillas only took about 8 minutes. From my tests and tastings, I like best the tortilla method that calls for olive oil, all-purpose flour, and no baking powder. This will be my go-to recipe. I’ll probably try different types of flour – cassava, barley flour, whole wheat pastry flour, perhaps others – and different mixtures of flours, like half all-purpose and half a different flour. I use more salt than in the original recipe. 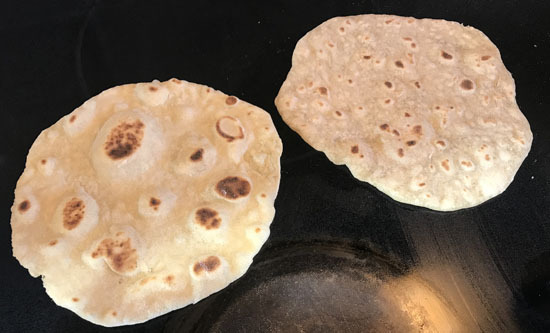 The whole wheat versions are healthier, and quite acceptable, but the others are softer and my husband likes them better, so white flour tortillas are my go-to at the moment. Mix the flour with the salt. Add about three-quarters of the hot water, all of the olive oil, and mix it all together with a spoon. Add more water only as necessary for the dough to hold together. Put the dough on a breadboard and knead a few times, until the dough forms a ball. Divide each dough into 8 equal sized pieces (by weight, if possible), form each portion into a ball, and let sit 2-3 hours at room temperature. Cook each side of the tortillas on a pre-heated flat pan pan. If possible, use a cast iron griddle. You do not need to oil the pan for these tortillas. If possible, monitor the temperature of the griddle with a remote sensor. Advantage? 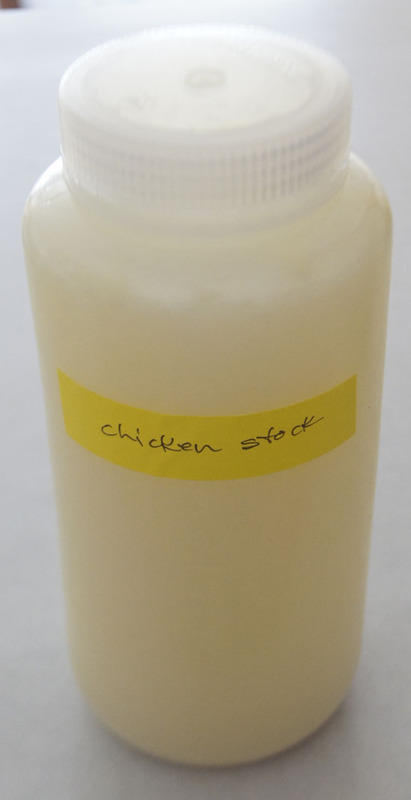 You can pull a bottle of stock out of the freezer, microwave on high for several minutes, and pour your homemade stock into a dish you are making within a few minutes. If you don’t use the whole bottle, put it back in the freezer for next time. That way, you know your stock. Much more than you know the stock out of a box from the market. You can make it preservative free, organic, salt-free, or seasoned as you like. And it is less expensive. I made 8 liters chicken stock (8.5 quarts, 136 ounces), an amount equal to 4 1/4 boxes of purchased stock (packaged in 32 ounce packages), for $8.50 (an organic chicken). If you purchase quality, organic stock, that is about $15. Another advantage is that you are storing the stock in a freezable container. Thus, you simply put it back in the freezer. When I use purchased stock from a box, I often store it in the refrigerator, thinking I will use the rest soon. But often I do not, and have to throw it out in a few days or weeks. Plus it is a stock, not a broth. Stocks are made using the bones. My stock is much more concentrated than the water-y stock I find in the store-bought boxes. I took a large, whole organic chicken and put it in my big 12 quart pot. I added water to cover (and more, nearly to the top of the pot), some celery and carrots (not even necessarily chopped), some salt and maybe some oregano, and simmered several hours. I stop the simmering about the time the chicken is falling off the bone. Then I strain it through a wire strainer. It might take several batches to strain all of the stock. When the entire pot has been put through the strainer, I “rinse” the bones, meat and skin with some water. Next, I portion the stock into large, covered containers, like big rubbermaid containers with a good lid. I refrigerate it overnight. The next day, I take it out of the refrigerator and skim off the hardened fat. The remaining stock is a bit viscous, so I let it warm up for an hour or two. Then, I funnel it into the Nalgene bottles. Toss them in oil and then brown them in the pressure cooker (large one) on both sides. Add several carrots (not peeled) and a bunch of celery, peppercorns and 1/4 t salt. Fill pressure cooker to 2/3 volume with water, and pressure cook 50 minutes (start timing when the first hiss becomes apparent). Let cool before opening. Strain through a colander, then line a colander with cheesecloth and strain again. This makes less stock than the chicken stock recipe, since my electric pressure cooker only holds 6 quarts. I treat my beef stock like liquid gold – it is dark brown and wonderful. So, so much better than common beef broth from the stores. Sometimes, if I have leftover beef bones from a rib roast or the like, I make my beef stock in a matter more like my chicken stock. But the small batch pressure cooker beef stock is the best. Once I made fish stock. I got some fish bones from Whole Foods and followed a recipe from somewhere on the web. But it was stinky, and I don’t use it often, so I never made it again. I’ve made vegetable stock, I think, but I don’t use it very often and would have to find a recipe. I do not keep any type of bouillon cubes or granules in my pantry any more. I spoil myself with my own chicken and beef stocks! The trick is storing them in microwave-able bottles in the freezer.